“Stu” from The Share also happens to be an extraordinary Playwright. 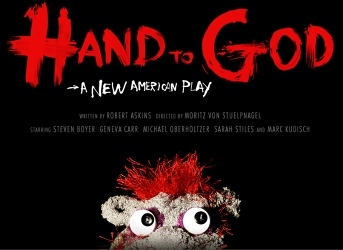 Robert Askins’ Play HAND TO GOD was first produced at The Ensemble Studio Theatre, then at MCC, and now catch it on BROADWAY spring 2015. “Nathan” from The Share is an award-winning actor. Steven Boyer has won an OBIE and a LUCILLE LORTEL Award for his outstanding performances as Jason and Tyrone in HAND TO GOD. Let’s see what he can do on the Great White Way.